This is pretty interesting: a serious plan, proposed by the United States Marine Corps, for suborbital launch vehicles, able to put a small fighting force anywhere on Earth within an hour or two. Lots of technical details to be ironed out, to be sure, but it's a bold concept... and one with numerous spinoff applications. (Can you imagine being able to deliver a Red Cross shipment to a disaster zone from across the planet? How about suborbital airliners, as described here and elsewhere, to go from Los Angeles to Sydney in two hours?) Thanks to Jeff Harrell for the link! And this is just amazing. An Israeli archaeologist, disgusted by repeated revisionist claims that King David never existed (for if he had, wouldn't we have found artifacts of his by now? ), did the research and legwork to pinpoint where his palace would have been, as described in the book of Samuel. She then got funding for an archaeological dig... and she found it. Stay tuned on this. It's already described as "the archaeological find of the century", and that's no exaggeration. "For me, finding the bulla was tremendous," says Mazar. "Yehuchal was no longer just some name in a biblical account that I might not even have been sure was true. He was a real person. We now have his business card. The account is a real account. It is very rare to find such precise evidence for a narrative in the Bible." In its own way, discovering that bulla is as exciting as the discovery of Elazar ben-Yair's lot, from the last moments of the Jewish revolt on Masada in 73 AD. For those who don't know the story: after a lengthy siege and more than a million deaths, Jerusalem was sacked and the Holy Temple burned by the Romans in 70 AD; that date, the ninth of Av by the Hebrew calendar, is still a date of mourning for Jews, nearly two thousand years later. But a small group of guerilla fighters and their families, commanded by a charismatic leader named Elazar ben-Yair, eluded the slaughter and made their way south, to King Herod's abandoned summer palace on the moutaintop of Masada, on the shores of the Dead Sea. There the Zealots, as the Romans called them, made their last stand: less than a thousand men, women, and children against five thousand Roman legionnaires. For three years they held their own there -- living, working, praying, even minting their own currency -- while under siege by the Romans. But the Romans finally prevailed, and -- in a dramatic event almost without parallel in history -- ben-Yair used his leadership one last time, to persuade his ragtag band that it was better to commit suicide, en masse, and take the Romans' victory from them. Better to die at our own hands as free men, he said, than to live as slaves. So the thousand Jews divided themselves into groups of ten, each with a captain, and the captain then quickly and mercifully killed his group-mates. Then the captains grouped together, cast their own lots to elect their leaders, and each leader killed the members of his group. This continued until only one man was left, who then killed himself. The Romans burst in upon the mountain fortress the next day... and found only bodies. Well, not quite. Two women and five children had hidden themselves away, and so they remained to tell the story of Masada's last days to the awestruck Roman historian Josephus, himself a Jew. So it is that, incredible as it sounds, we have a transcript of Elazar ben-Yair's final speech to the Zealots. It is a pot-sherd, a clay fragment of the sort used routinely for scribbling short notes... or for casting lots. 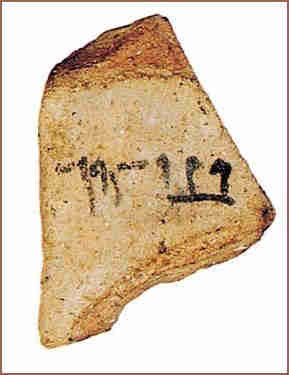 Written on this particular fragment is the name ben-Yair. We can safely assume that it was this fragment, probably written in his own handwriting, with which he cast lots, along with the rest of his people... and then died, as he had lived, a free man, beholden only to God.